A “cautiously optimistic” Gov. Chris Christie will be at the U.S. Supreme Court Monday to to lend moral support as New Jersey lawyers try to convince the justices to allow legal sports betting at Garden State racetracks and casinos. “I’m looking forward to being in court,” Christie told reporters at a public event in Newark Wednesday. 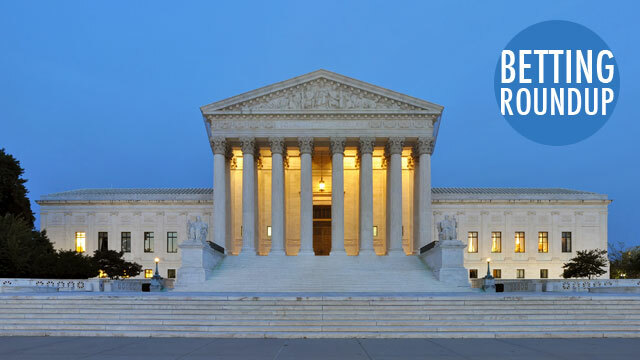 An opinion article published by the Washington Post said the Supreme Court should allow states to determine whether or not to legalize sports betting. The court’s nine fine minds need not, and should not, trouble themselves with the question of whether this particular prohibition is sensible. They should, however, defend federalism by telling the national government to stop telling state governments what laws they cannot change. While all four U.S. major sports leagues are fighting New Jersey’s sports betting challenge, commissioners of three of the four leagues have made public comments in support of sports betting. The NBA and Major League Baseball see gambling as something that could enhance fan interest and open up new revenue opportunities. However, the leagues insist that appropriate regulations should be put in place to prevent corruption— something that a court ruling in New Jersey’s favor wouldn’t do, at least not right away. FanDuel announced that CEO Nigel Eccles will step down. Nigel Eccles, CEO and founder of daily fantasy operator FanDuel, is stepping down to pursue other opportunities, the company announced Monday morning. Matt King, who served as Chief Financial Officer of FanDuel from 2014-16, will return to the company to replace Eccles as CEO and join the board of directors, effective immediately. Eccles, 42, founded FanDuel in 2009 and is considered the “Godfather of daily fantasy sports” by some in the industry. Under his direction, the company rose to the top of the daily fantasy industry, alongside rival DraftKings. NFL favorites went 37-15-4 against the spread in November, the best record in the Super Bowl era. The run of favorites began on Thanksgiving, when the Minnesota Vikings, Los Angeles Chargers and Washington Redskins all covered the spread. Those teams were on many of the parlays that were live entering Sunday. CG Technology had a minus-20 percent hold on parlays after the late slate of games. The Philadelphia Eagles are closing in the New England Patriots as favorites to win the Super Bowl. Long shots to start the season, the Philadelphia Eagles have emerged as the clear-cut favorites in the NFC and are closing in on the New England Patriots at the top of the Las Vegas sportsbooks’ odds to win the Super Bowl. The Eagles, who had odds as high as 65-1 in the offseason to win the Super Bowl, are now 4-1 at the Westgate SuperBook, behind only the Patriots at 7-2. Philadelphia has won seven in a row and separated itself from other contenders in the NFC. The Eagles are 2-1 to win the conference and overwhelming -1,200 favorites in the NFC East. “They’re legit, well-coached, well-quarterbacked,” said South Point sportsbook director Chris Andrews, who last week moved the Eagles (7-2) ahead of the Patriots (4-1) in his Super Bowl odds.